[eBook] Education Pack "all different - all equal"
It is easy to say "I have no prejudices", "I'm not racist, so it has nothing to do with me", "I didn't invite those refugees". It is hard to say "I may not be to blame for what happened in the past but I want to take responsibility for making sure it doesn't continue in the future". 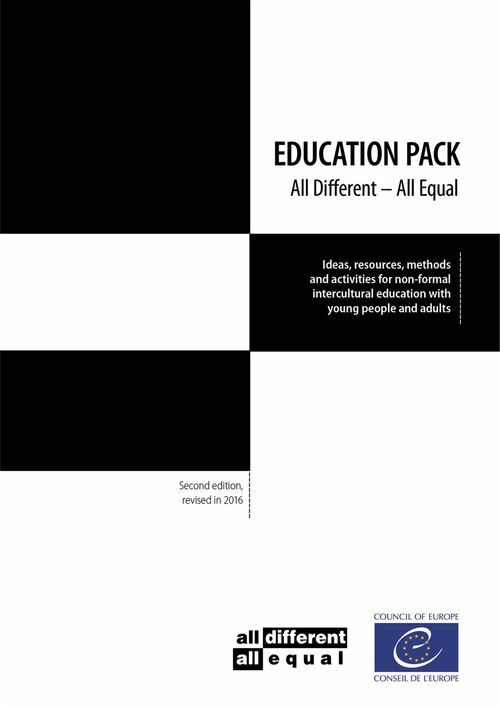 The Education Pack "all different - all equal" was originally produced in 1995 as an educational resource for the European youth campaign against racism, antisemitism, xenophobia and intolerance. Soon after its publication it became a reference work for those involved in intercultural education and training with young people across Europe and beyond. Translated into many languages, it remains today one of the most successful and most sought after publications of the Council of Europe. The usefulness of the pack stems from the variety and creativity of the methodologies proposed. More than twenty years after the "all different - all equal" campaign, the role plays, simulation exercices, case studies and cooperative group work that it proposes remain an inspiration to many youth workers, trainers, teachers and other people actively involved in intercultural education. European societies continue to suffer from a growth of racist hostility and intolerance towards minorities and foreigners; the necessity for intercultural youth work remains undiminished and the relevance of this pack remains unquestionable. Little bit has been changed in this new edition of the pack, apart from an updating of references. Most changes are visible and usable only in the online version, which offers relevant links with other resources for human rights education which continue the legacy of the campaign: equality in dignity and rights, respect for broader appreciation of diversity.